It rained this weekend. A lot. It rained last weekend too. Afraid that I might actually lose my mind if I had to spend another weekend with nothing to occupy my mind while hemmed up in the house with a bunch of bored onions, I started the rainy weekend prepared with LOTS of groceries, a new book, a new family game, supplies for a craft project and a new movie. BOOM. Bring it, rain. I’d like to take a minute and tell you about the craft project and why I’m pretty sure we all have cancer now. Have you seen the one on Pinterest where you arrange plastic beads in a cake pan and melt them in the oven to make sun catchers? Well, I thought that sounded like a super cool project for the onions. We carefully assembled all our beads (then I tripped over the dog on the way to the oven with Brutus’ creation and totally ruined it which resulted in a whole lot of crying, another hour spent redoing it and my first beer of the day) and popped them in the oven per the instructions. I’m no rocket scientist but I’m fairly certain the fumes coming out of my oven could not have been healthy. Don’t worry. I kicked the kids out onto the screened porch once my eyes started watering, my throat closed up and the cats passed out. Don’t call the authorities. I don't actually think the kids were harmed. Me and the cats? Possibly. Anywho, once I aired the house out, I decided to try a new recipe. This is really just a spin-off of the Cheesy Chicken Enchiladas. I thought it would be neat to make little bundles instead of the rolled enchiladas. The enchiladas can be hard to plate sometimes and if I ever wanted to make a massive batch, the little chimichangas would be easy to make fit into other size pans. Spray a 13x9 backing dish with cooking spray. Spoon 1/6 of the mixture into the center of a tortilla. Fold four sides of the tortilla to make a square and place, folded side down, into the baking dish. Repeat until you've assembled six chimichangas, placing all in the dish (two rows of three). Mound shredded cheese evenly over chimichangas Pour whipping cream over cheese (the cream and cheese will scatter a bit throughout the dish - that's OK). Cover dish with aluminum foil and bake for 30 minutes at 350 degrees. Remove aluminum foil and continue cooking for 10-15 minutes or until cheese has started to brown. *Absolutely no substitutions! This is what they use to make queso dip at the Mexican restaurants. REALLY. You can find Land o’ Lakes White American cheese in the deli at Wal-Mart and Publix. You’ll need about 1/2 a pound for 2-3 cups of shredded cheese. And you'll prolly have to tell them not to slice it. These sound fabulous! Think I'll try them this weekend! I like to copy and paste recipes into a cook book of sorts that I made. I can't copy your recipes. Can you help? You can print the recipes if that helps. Unfortunately, I had to disable copy/paste from the blog because so many other sites and FB pages were poaching the photos and recipes and passing them off as their own. These look so good and sound so easy. Thanks for recipe. I am making this tonight, I also made some home made salsa I am so excited I cannot wait to eat this. I think you and I could be best friends. Your posts make me LAUGH out LOUD, really... not just heehee but OUT LOUD! Thank you for sharing your love of food and being a southern woman. HA! That's awesome to hear! Like, REALLY! Glad you found your way here! I tried this recipe because it looked delicious and reminds me a lot of chicken enchilladas. However, a chimichanga is fried so that the tortilla is crispy. They can be baked or fried. I used to work in a Mexican restaurant and we had to ask the customers which way they wanted them. Mmmmm, I am DEFINITELY making these for my soldier-son! He will be home on leave in just a few days! We love these! Although I did cheat, I used the Velveeta shredded white queso. I made my chicken and shredded it the day before, as I don't have a lot of time in the evening with work, and just added it to the cream cheese and chilies to heat back up. I told my husband he'd better eat them even if he didn't like them because I spent 2 evenings making the *bleep bleep* enchiladas, but they were wonderful. Our neighbor and hubby's best friend wants me to make these a every week meal. Hey Mandy! 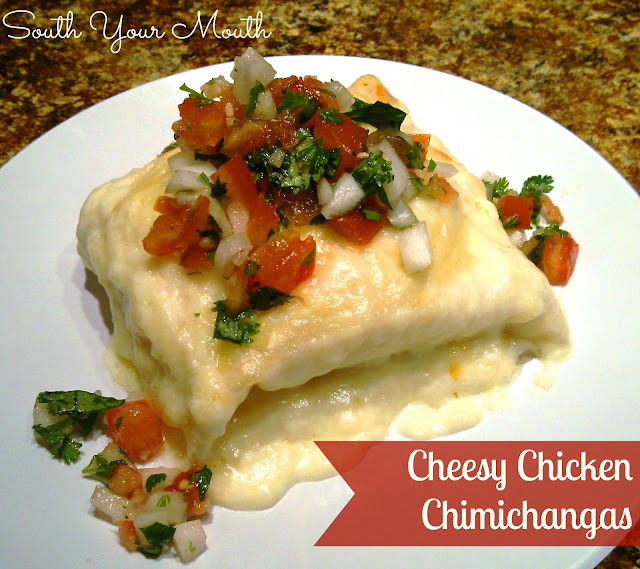 I'm a southerner by birth, but I live in Ireland with my husband :) I'd love to make these chimichangas, but I won't be able to find white American cheese ANYwhere... or velveeta.... any other suggestions on what I could use? Thanks a mil! Oh, Lord. I have no idea. You're in the land of good cheese so finding easy-melting junk like this processed stuff will be hard. I'd just top it with a mild shredded cheese, cover and bake without the cream. It won't be quite the same but it'll still be good! I'm in New Zealand so have the same problem as sweetsarahkay in regards to American Cheese. I've had a look on the internet and most sites say it's the stuff that comes pre wrapped in single slices. Please say it isn't so. When you cook mexican food for a living (cuz im mexican with 3 grown boys in my house) you run out of ideas. I can pretty much make anything from italian food, puerto rican food, chinese food. I still get bored, but when I saw these, I actually hit myself on the head (like the old v-8 commercials) so I tried them and gurl, mmm mmm mmm TY!